When you start a new game of Mass Effect: Andromeda in about a month’s time, the character creator will let you choose the gender of original protagonist Commander Shepard, suggesting he or she (as you like) will at least be referenced by the story. We also learned how exactly your character – one of the Ryder twins – will be affected by the training options you can choose. What challenges await in the new galaxy? Check out our Mass Effect: Andromeda story guide. We found this out for ourselves during our recent hands-on session with the game. Among the options for Ryder’s gender, appearance, name and training was a section to choose Shepard’s background. It was the first thing we clicked, wondering whether we’d get to pick from the familiar origin stories, famous deeds or perhaps even decisions from the first three games, but the only option is to decide whether Shepard was male or female. This suggests Shepard will at least be referenced in Mass Effect: Andromeda, but probably only inasmuch as the game’s codex – and possibly dialogue – needs to use the correct pronoun. 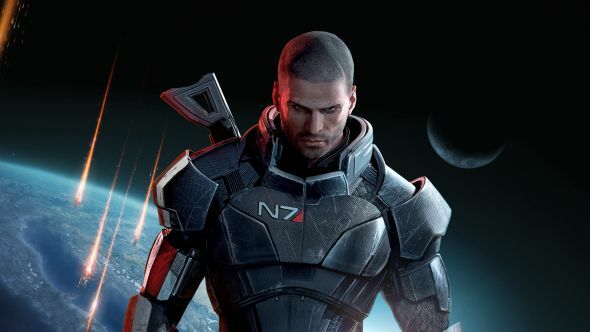 We know that the Andromeda Initiative leaves the Milky Way sometime between Mass Effect 2 and 3, so Shepard is quite a prominent figure in the galaxy and a passing mention isn’t surprising. Hence, it’s understandable if BioWare were nervous about such a mention establishing the gender of the player’s Shepard without letting them decide. Evidently, though, Andromeda’s story doesn’t need to go into detail about Shepard’s achivements. Elsewhere on the character creator, we learned more about what Ryder’s training will mean in the game; it decides your initial abilities. There are six options: Security, Biotic, Technician, Leader, Scrapper and Operative. Most are roughly equivalent to the old starting classes: Operatives start with a tactical cloak and are basically Infiltrators, while Scrappers, who start with the biotic ‘Charge’ power and some points in combat fitness, are probably closest to Vanguards. Leaders are trickier to place: they start with energy drain and a new skill called ‘team support’, which apparently gives access to special tech to help squad survivability. Unlike previous games, your initial training won’t limit your future build. You can take skills from any of the three categories (combat, biotics and tech), with the only limitation being that some key skills require prior investment in that category. If you don’t pick Operative at the start, for instance, you’ll need to spend nine points on other tech skills to unlock tactical cloak later. If you make a mistake, don’t fret; you can do a full respec in the Tempest’s medbay. For more on how skills, classes and leveling will work in Andromeda, look out for our forthcoming combat guide.